The latest Shipshape Network newsletter brings happy news that the restoration of the Uffa Fox designed Flying 30, Huff of Arklow, is progressing rapidly and is to be relaunched on the 7th September. 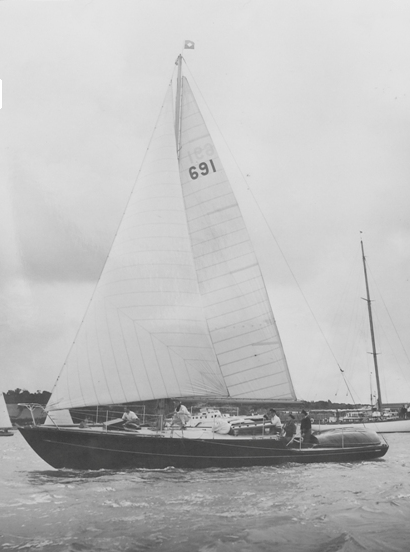 An enlarged version of Fox’s wonderfully elegant Flying 15 design, Huff was was built in 1951 in Arklow by John Tyrrell & Sons (see list of Tyrell-built craft) for the well known yachtsman Douglas Heard. She’s an important boat in several ways – she was the first masthead rigged sloop designed to plane and the first ocean-going yacht designed to plane. And she is fast, certainly – she recorded a speed of 23 knots on a trip to Iceland in 1960. Read about Huff of Arklow and her restoration here and here. Oh, and there are a Facebook page and a Twitter account to follow too! PS – Martha’s Vineyard sailor and boat surveyor Ginny Jones wrote to tell me about this YouTube video about Huff, complete with Uffa Fox singing a stage sea song, some modern pop stuff with photos of kid’s and their models of Huff, and finally photos of her pre-restoration interior, with someone (I don’t know who) singing a proper sea song, the Sailor’s ABC.